Summer is a time of beachy bracelets, rope necklaces, bold colors, and nautical prints; but, sometimes even in the hot summer season, you need a little bling in your life. Every girl’s gotta have a little sparkle, even in the summer months. There is no better way to add a little shiny element to your ensemble than with a lovely homemade jewelry piece. That is where these trendy summer metallics come in. Wear these bright and shiny precious metal hues all summer long. If you are looking to stay chic with this summer trend, AllFreeJewelryMaking has compiled a list for you of some of these fabulous metallic jewelry projects. Shimmer and shine with this sparkly summer trend! 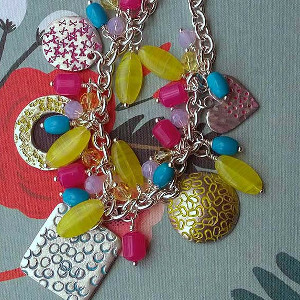 One of the best ways to get this trendy summer look is with this luminous necklace pattern. The Metal on the Moon Necklace is a sweet, inexpensive knockoff that will surely put a smile on your face during the sunshine season. 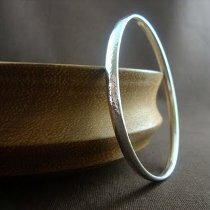 Making bangles from scratch can be a little tricky, but these metallic bangles are well worth the effort. 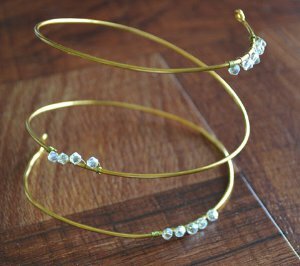 Thin and light for summer, but classy for the whole year round, there are endless benefits to these pretty DIY bangles. Perfect for beginner and those new to the art of metal stamping, this precious little locket is a lovely DIY metal stamped jewelry project. Simple and sweet this homemade locket is sure to be near and dear to your heart this summer and beyond. This Classic Crystal Arm Cuff is a quick and easy project that is sure to impress. The gold wire is pretty enough on its own, but the crystal beads are what set this accessory apart. Plus, its thin wire keeps it from being heavy during the summer season. In under a half an hour, you can create chic boutique style jewelry with just a design stamp, texture hammer and a few blanks. Follow this step-by-step tutorial, and you will be amazed at how easy these DIY metal earrings are to make. Celebrate summer flower season with these pretty-as-can-be DIY earrings. 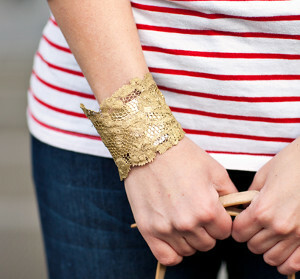 This Metallic Lace Cuff is a DIY bracelet made for showing off, and not just because it’s designer-inspired. Bright gold coloring combined with the delicacy of a lace bracelet design ensures that this fantastic cuff will be a keeper for your wardrobe for this summer and beyond. Speaking of trendy jewelry, there is nothing quite as trendy for summer as friendship bracelets. These DIY bracelets are a staple of the season. Think friendship bracelets are just for kids? Think again! 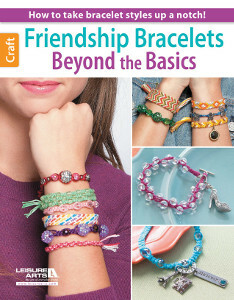 In Friendship Bracelets Beyond the Basics, from Leisure Arts, you’ll kind tutorials that everyone can enjoy. 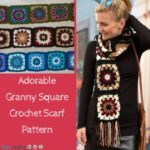 Kids, teens, and adults alike will find patterns they adore in this compilation of nineteen friendship bracelet tutorials. Enter to win Friendship Bracelets Beyond the Basics by June 10, 2014, at 11:59:59 p.m. Eastern Time. What is your favorite summer jewelry trend? One of the hottest trends in the jewelry making world right now is metal stamping. Have you tried it yet? 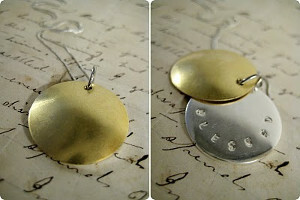 Metal Stamping is a great way to make handmade jewelry. It is such a fun way to make personalized DIY jewelry pieces. Beading is the best, but sometimes it is good to step outside the box and learn a new skill. That is why we at AllFreeJewelryMaking have put together this list of some exciting metal stamping tutorials, just for you. Whether you are new to the craft, or a veteran of metal stamping, you will love these fantastic homemade jewelry projects. 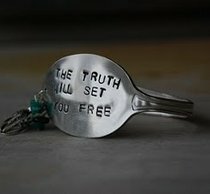 From stunning DIY pendants to stylish homemade bracelets, you are sure to find the right metal stamped jewelry piece for you among these projects. 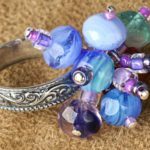 There are projects for everyone, from beginner to veteran jewelry makers, so no matter what your skill level, you will have a gorgeous piece to create. Learn new skills, like How to Stamp Metal Charms and the art of Transferring Images to Metal. A wide range of jewelry making opportunities arise when you master this metal stamping technique. Now that you have mastered metal stamping for your bracelet and necklace projects, you will need a pair of DIY earrings to complete your look. Learn how to make simple Textured Metal Earrings with this informative tutorial. 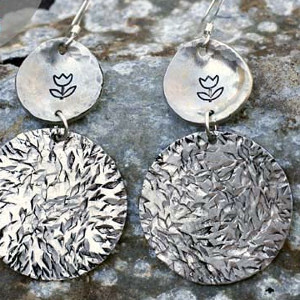 Soon you’ll be creating chic boutique style jewelry like these May Flowers Metal Stamped Earrings. There are so many creative possibilities for making your own jewelry with this stamping technique. 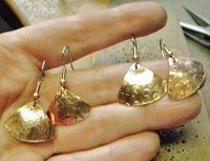 Be sure to check out AllFreeJewelryMaking.com for the latest metal stamping jewelry tutorials! 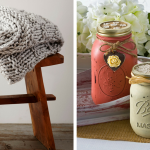 Win the supplies to make these amazing projects! Enter to win an ImpressArt Newsprint Premium Metal Stamping Kit from ImpressArt. We are giving away one fabulous metal stamping kit to one lucky winner. 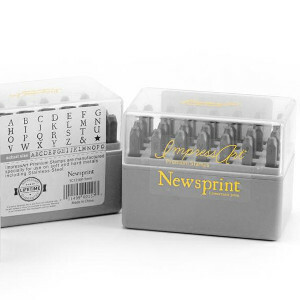 In this awesome stamping kit, you will receive a set of premium newsprint lowercase stamps, a set of newsprint lower case stamps, over a dozen pairs of stamping blanks, a Crystal Rivet Setting Kit, Prism Czech Rivets, and a 1/2 lb metal stamping hammer. The deadline to enter is March 17th, 2014, at 11:59:59 p.m. Eastern Time. Do you wear metal jewelry? 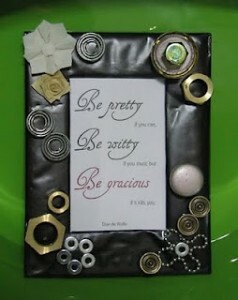 Win an ImpressArt Metal Stamping Kit from AllFreeJewelryMaking! Metal stamping is taking the craft world by storm, and the new ImpressArt Metal Stamping Kit is making this popular medium more accessible than ever before. Never tried metal stamping? No problem! 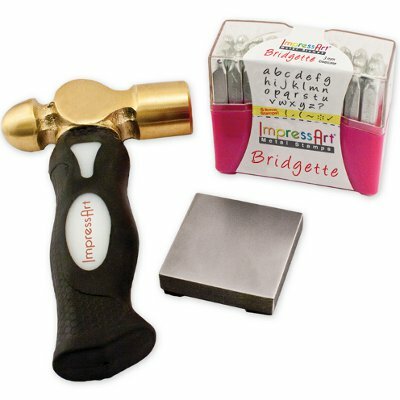 With the ImpressArt kit, you have everything you need to get started right there in one convenient package. But the best news of all? ImpressArt was generous enough to gift AllFreeJewelryMaking with one of these fabulous kits, and we’re giving it away to one very, very lucky reader! The new ImpressArt Metal Stamping Kit, voted by the Craft and Hobby Association as one of the “Hot 20” new products of 2012, comes fully equipped with everything you need to become a master of the metal stamping art form. With a 1-pound brass metal hammer, a 3mm designer alphabet stamp set, a 2-inch steel block, and a step-by-step metal stamping instruction guide, you’ll instantly add a new technique to your crafting skill set. Plus, ImpressArt has thrown in an assortment of free stamping blanks as a bonus! That means the winner of this contest will have everything they need to get started making metal stamp jewelry as soon as they receive the prize! The kit that ImpressArt has gifted for this giveaway includes a set of alphabet stamps in lovely Bridgette Lowercase, but the kits also come in three other font options including Newsprint, Jeanie, and Ballroom Boogie. One of the added perks of this kit is that the stamps can be used on other materials, such as leather, wood, card stock, and clay, so if metal is not your medium of choice, you have an endless array of other creative options before you! The contest ends August 27, 2012. You can enter once daily, so return often to improve your chances of winning! Have you ever tried metal stamping? 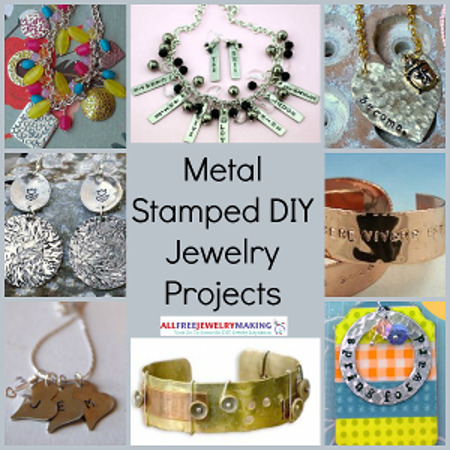 Would you like making your own metal stamp jewelry? Never heard of metal clay, let alone tried to use it in jewelry making? No problem! This instructional guide goes in depth with all the beginner basics before jumping into the projects and tutorials. You’ll learn exactly what it is, where to buy it, what forms it comes in, what tools you’ll need to work with it, and what basic techniques you’ll need to know, all before you even see a project. 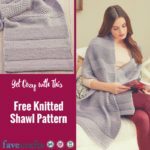 Then, once you’re comfortable with the basics, you delve into the tutorials, beginning with the easier projects and gradually advancing into the more intricate techniques and designs. You’ll learn how to make stamped charms, mobile earrings, draped lace pendants, bejeweled cobra earrings, twisted rings, feather earrings, hollow lentil beads, mosaic pendants, and so much more! This book guides you along the way, offering tips, tricks, and plenty of colorful pictures as guidance. 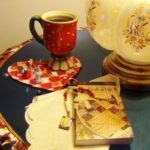 By the time you finish this book, you’ll be an expert in making metal clay jewelry, and you’ll have a ton of gorgeous accessories to prove it! 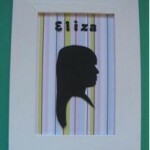 The contest ends April 23, 2012, so enter for your chance to win today! And don’t forget, you can enter once daily, so return often to improve your chances of winning! Have you ever worked with metal clay? 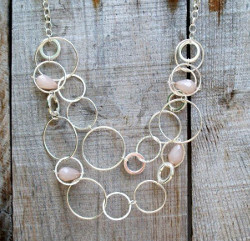 What new jewelry making medium would you love to try? Steampunking: When Victorian feminine style meets robust metallic accents. It’s the ultimate clash of opposite medias…and it’s the latest craze sweeping the crafting world. Steampunking gives a whole new meaning to “girly gear”, mixing lace and metal to get the ultimate in jewelry accessories. Common steampunk supplies include vintage clock gears, cogs, various pocket watch parts, and other brass findings, like washers and nuts. Mix these odds and ends with feminine lace, Victorian accents, and 18th century style accessories and you’ve got one heck of an art piece. 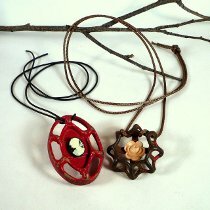 Similar to mixed media art, steampunk jewelry is great for those who love to shop the thrift and junk stores. 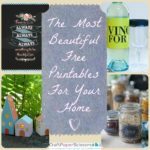 Chances are you could probably create a stunning piece from the stuff sitting in your junk drawer right now! So gather up those broken nick knacks and let’s turn them into something fabulous! 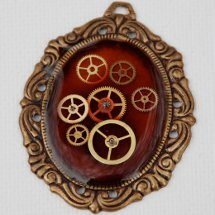 Get your creative gears moving with this Quick Steampunk Pendant. This locket charm is a great project for steampunk beginners. You can easily make it into a necklace, a pin, or even a beautiful Victorian brooch. 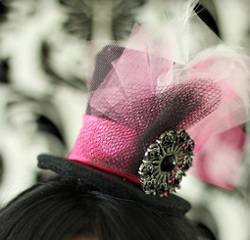 I know we’ve got some time before Halloween, but I just can’t wait to make this cute Mini Top Hat. While most steampunk crafts are heavy on the medal, this whimsical top hat is more Victorian with subtle hints of metallic flair…perfect for Halloween, New Year’s parties, or even Mad Hatter Tea Parties! 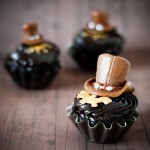 Speaking of The Mad Hatter, I cannot tell you how much I love these Steampunk Cupcakes. These little decadent bites are perfect for Victorian costume parties or masquerades…or even for hosting steampunk crafting parties! If you ask me, I’m all about simple and savvy jewelry. Don’t get me wrong, I enjoy a little color and sparkle, but I’d take something soft and feminine over something glitzy and shiny…and that’s why I just love these Faucet Handle Necklaces. The sweet flower in the center of these steampunk necklaces reminds me that there’s life and joy in even the dirtiest of places! Even those who don’t really like the technical look of steampunk accessories can still enjoy creating steampunk crafts. These Full Steam Ahead Earrings use metallic items to make steampunk earrings that look classy and vintage. I love that these earrings could go with just about anything, from jeans and a tee to a little black dress! Love the steampunk look but don’t want to wear it? Steampunk home décor is a great way to add vintage charm to your living space. This Steampunk Frame is a great way to get started and experiment with different techniques and styles. 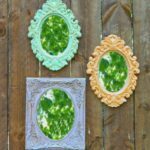 A trip to the thrift store or hardware store will give you enough materials to create this frame in no time. I don’t know about you, but I’m really excited to try this new steampunking craze! Plus now I have a great use for all my broken watches and jewelry! What do you think of steampunk jewelry? People seem to love it or hate it, and we wanna hear what you think!